Like Sufjan Stevens, Belle & Sebastian had gone several years without releasing an album by 2010. Also like Stevens, there had been diversions along the way, most notably 2009's God Help the Girl album of songs written by bandleader Stuart Murdoch, and featuring most of the group (albeit with vocal duties handled by outsiders), as well as the 2008 release of The BBC Sessions. 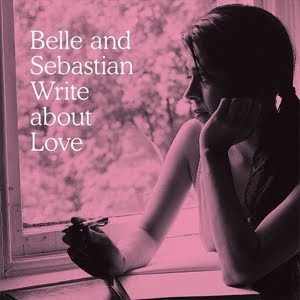 So it may not have seemed like it, but by the release of Write About Love, four and half years had passed since the last studio album by Belle & Sebastian - by far their longest break (and approximately as long as the break between posts on this humble blog...). The album opens with Sarah Martin's 'I Didn't See It Coming', the first time one of the band's non-Murdoch members has been handed opening-track duties. And 'I Didn't See It Coming' is easily Martin's best song to date - a gorgeous melody, and wonderful vocals from her & Murdoch. 'Come On Sister' is similarly upbeat, and points to the album being similar in feel to its predecessor 'The Life Pursuit'. Track three, 'Calculating Bimbo', quietens things down, however, and also provides this album's first character-sketch-as-lyric song (a speciality of Murdoch's). My favourite track off Write About Love (& one of my favourites by anyone in 2010) is up next: 'I Want The World To Stop'. It's an unashamedly pop song, with Murdoch's vocals, superbly supported by some of the others, atop the band firing on all cylinders. Unfortunately, it's followed by the underwhelming Norah Jones duet, 'Little Lou, Ugly Jack, Prophet John'. While Murdoch's & Jones's voices play well off each other, and the production is as lush as B&S will ever provide, it definitely feels like a Norah Jones song, not her on a B&S song. An interesting diversion, yes, but not much more than that. Guitarist Stevie Jackson's lone songwriting contributing to Write About Love is 'I'm Not Living in the Real World', and it shares the off-kilter pop feel of many of his songs. Two quiet songs follow, 'The Ghost of Rockschool' and 'Read the Blessed Pages'. Both are pleasant without being particularly memorable (the latter sounds a little as if it is about former bandmember/Murdoch ex- Isobel Campbell - but that might not be accurate or fair). If I had a criticism to make of modern Belle & Sebastian, it's that the slower songs seem to have lost their bite - while slow, quiet songs on the band's first few albums tended to be some of the highlights, these two (along with 'Calculating Bimbo' & 'Little Lou...') are a little too '70s radio pop for me. A decade ago, who could have imagined that the peaks on the new Belle & Sebastian album would be soul-inflected pop songs that you could dance to, and the hushed ballads would feel out of place? That's testament to the band's growth, of course, but it also feels odd to be underwhelmed by the quiet tracks here.